Canada is home to a vibrant “local food movement” with initiatives in every province. Increasingly, Canadian consumers are buying and eating local food for many reasons - freshness, taste, health, the environment, local economic development, and support for local farmers. As local food continues to grow in popularity, communities are organizing ways to access sustainable and locally-grown food. These include farmers markets, community shared agriculture, box programs, local marketing groups, and retail stores. A recent study by the Canadian Co-operative Association (CCA) found that there are approximately 2,300 local food initiatives in Canada and twenty four umbrella organizations that promote and support these various initiatives. The first section profiles eleven successful co-operatives that have organized to overcome aparticular challenge in the production, marketing, retailing, or processing of local food. These profiles include a co-operative farmers’ market, several producer marketing groups, two stores, a produce auction, an on-line ordering system, a food distribution and storage business, and a regional value chain. The second section briefly describes what Canada’s retail co-ops are doing to integrate local food into their stores. It covers three federations and the independent natural food co-ops that were created in the seventies to sell organic food. Even the well established retail food co-operatives and their respective federations are playing a significant role in the marketing of local food in Canada. 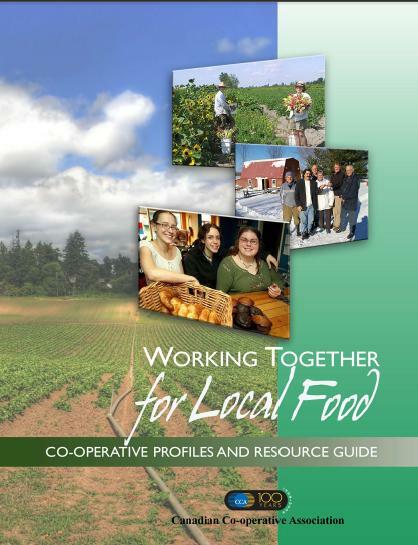 The third section provides a resource guide for new and emerging co-operatives to find the information, funding, and assistance to plan and develop a local food co-operative. The guide is organized by province but also contains a national section and general tips for finding help.